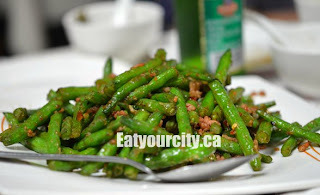 Eat Your City: Wok N Roll - Back again for some tasty and inexpensive Chinese fare! 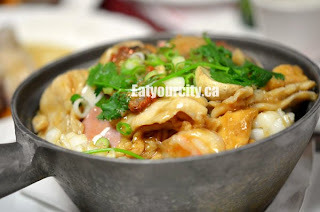 Wok N Roll - Back again for some tasty and inexpensive Chinese fare! We were craving some Chinese food, so we rounded up some of our usual suspects and head to Wok N Roll, as our friends haven't tried it yet. We made the mistake of not making a reservation, and the restaurant was packed to the rafters on a Saturday night. We pre-ordered items we wanted to eat while we waited, and after a 30min wait, we were whisked to a clean table. Service is efficient, and the kitchen proved again to have superhuman speed and great timing - within minutes of us sitting down and ordering a round of beer, the dishes started streaming out from the kitchen... yum! As we were a group of six, we went with the "set menu meal for six". The set menu is really a misnomer - you essentially have a choice of any six items from the extensive "set menu items". Pick four dishes if you're going with the four person set menu, six dishes for 6 people, eight for eight etc, and build your own 4, 6, 8 etc course meal. We picked a couple of our favorites from last time, and a few new dishes as well. 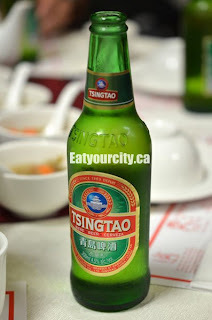 As we ordered the food while we were waiting, by the time we shed our coats and ordered a round of beer (Chinese beer as its Chinese food! 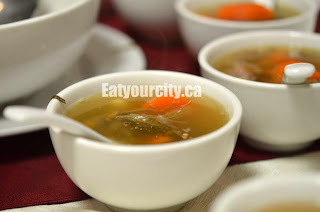 ), and a pot of Chinese tea, the food arrived on the table. Tsing Tao is a light bodied pale beer, which goes down easy and well with the myriad of flavors and dishes we ordered tonight. Give the Chinese teas a whirl if you haven't had a chance: Oolong or "Bo Lay" are stronger bodied black teas with high tannin content (quite bitter if steeped too long), while Jasmine or Chrysanthemum tea are lighter and highly fragrant teas due to the flower heads and buds added to the tea (more forgiving as the tannin content is low if you over steep). As Chinese tea goes, don't pull a faux pas and ask for sugar... they're meant to be sipped on sans sugar or cream! A marriage of crispy fried chicken and garlic. 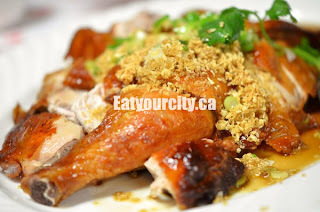 The skin was a glorious crispy golden brown, the meat was moist and tender - sitting in a small pool of sweetened soysauce and all of it was covered in a mini mountain of fried garlic. Oh man, I'm sooo there. Nom! After trying out one of their hotpots last time, we had to try another one this time around. We waited in anticipation when the lid was removed, and an assortment of shrimp, chicken strips, calamari, ham, basa fillet chunks and deep fried tofu puffs sizzled in the pot. Garnished with diced green onions and shredded cilantro and laced with plenty of a light garlic and ginger sauce, our table made quick work of this tasty hot pot! Again, being a dish that was a hit last time we came, we ordered it again and wasn't disappointed. Gently steamed (or poached?) to perfection and placed in a pool of sweetened soy sauce, its topped with a pile of aromatic slivered ginger, green onions and laced with a ginger infused oil. The chicken was silky tender, and picked up the ginger and green onion notes from the infused oil. If you wanted a bigger hit of flavor, take a bite with a pinch of the ginger and green onions. Simple and delicious! Apologies for the rough translation - just ask for it and the waitresses will know what you're talking about. 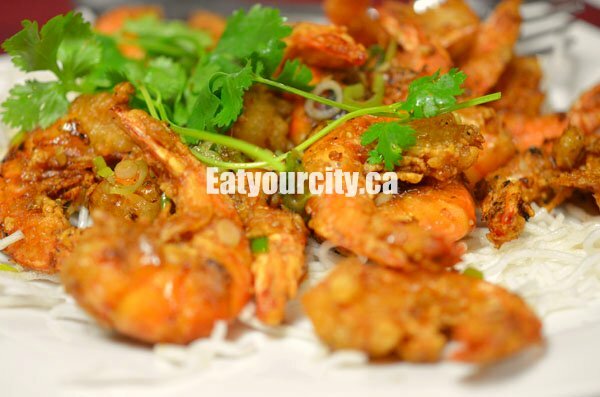 The shrimp is marinated in Maggi sauce, lightly coated in seasoned flour, and deep fried until the shells are super crunchy crisp. We made these savory tender crisp shrimp (on the inside) disappear in record time. Nommy nomnom! Last but not least was our vege dish of the night. The green beans were blanched and stir fried to a crunchy tender crisp with oodles of garlic, and a ridiculous amount of diced salty savory dried shrimp, and a hit of chili peppers. The dried shrimp added in a lot of salty savory goodness to this dish, almost a bit too salty, but that was okay, as you're supposed to eat it with plain rice. Nom! 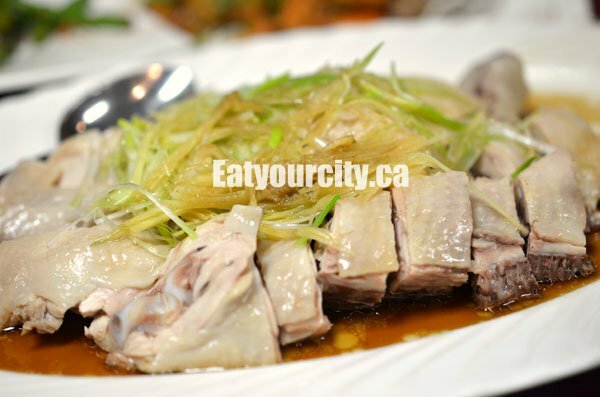 Overall, a great place for Chinese food for a ridiculously great deal. Its tasty, fast and very nice on your wallet. (At $64.99 for a 6 course dinner for 6 people = About $13/person or $20/person with a beer each plus a decent tip). So call up your friends, grab the kids for tasty Chinese fare in an unpretentious place that won't require you to air out your wallet, nor have to look forward to that next pay cheque.